Let’s be honest, buying diesel fuel isn’t the most exciting thing you’ll probably do with your life. Unless you have one of these that is; a Russian-made Sherp ATV! Crown Oil take a look at what it is, what it does and more importantly how to get your hands on one (sorry, I mean the facts and figures)! Go head to head with mother nature and win with this miniature beast on gigantic wheels. What is a Sherp ATV? 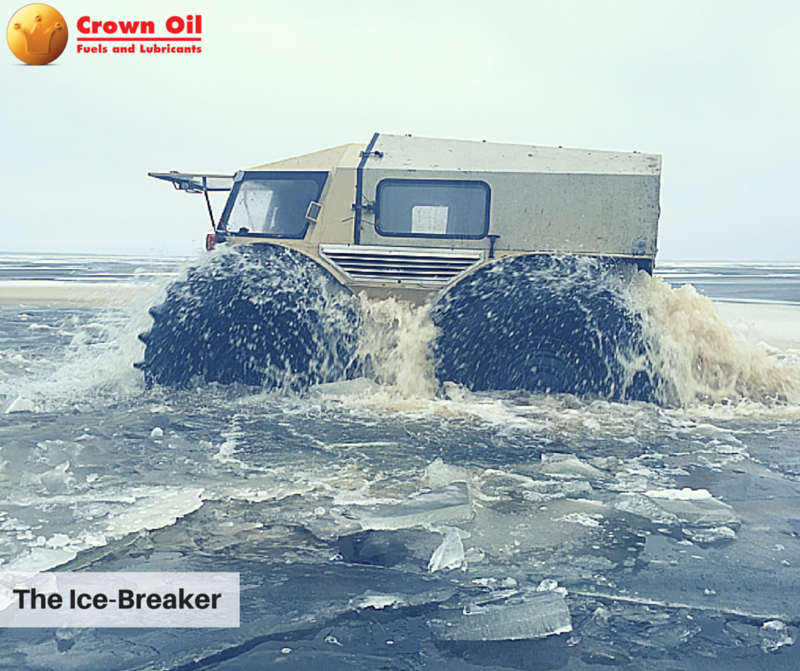 This two-seater, diesel-powered beast from the east (of Europe) is an all-terrain vehicle (ATV) which can literally navigate any terrain. Whether you frequently struggle with icy lakes, dense forests or just pot-holes on your local roads, the Sherp ATV makes driving fun; in what would otherwise be considered pretty laborious, and potentially very dangerous, driving routes. As one of the UK’s leading fuel and oil suppliers, we’d love to supply you with diesel fuel for your Sherp ATV should you ever own one. They’re not too pricey either. “How much is a Sherp ATV?” I hear you ask. Well, prices start at $65,000 which is a very reasonable £45,000 in English money. What else can you purchase for that sort of cash that can swim, ski and climb? The Sherp ATV is powered by a diesel engine, therefore, the fuel it needs for power is, yes you guessed it, diesel (also known as derv). Road diesel is currently cheaper than petrol so it means cheaper running costs! As this is an All Terrain Vehicle, I suspect the use of red diesel is okay as long as it is used off-road; which should help reduce the running costs further! Just like my trusty old Renault Clio Dynamique (I never thought I’d be comparing that to an ATV), the Sherp ATV is surprisingly powered by a 1.5-litre turbo-diesel engine. Producing just 44 HP, and weighing just over a tonne, the fuel consumption is actually pretty impressive! Unlike my old Clio, this thing can navigate pretty much anything life can throw at it! Including icy lakes! At 2-3 l/h the Sherp will use around 2 litres of diesel per hour on easy ground whilst using roughly 3 litres per hour off-road. Although, you shouldn’t worry about running out of diesel as we are a nationwide fuel supplier and we’ll deliver anywhere in the UK. 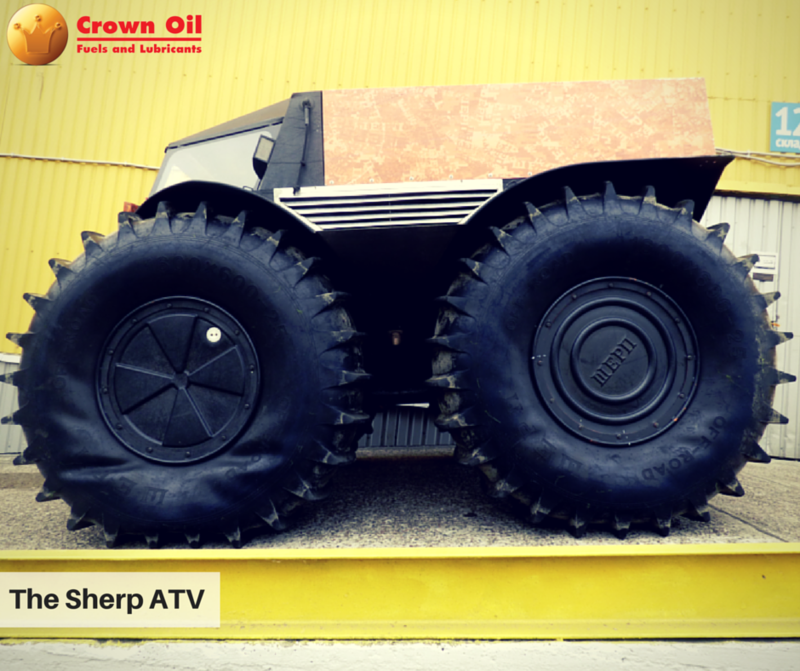 On a full tank of diesel fuel (58 litres) the Sherp ATV can cover some serious ground. Although, if you really want to travel the scenic route then I’d suggest expanding this fuel capacity by purchasing additional fuel tanks; to increase the total fuel capacity to a whopping 258 litres max. Although you can buy 1, 2, 3 or 4 extra tanks holding 50-litres each, it’s up to you! The Kubota V1505-t 1.5 turbo-diesel engine has a manual 5-speed gearbox which can propel the Sherp to a respectable 28 mph on land and cruise on water at 3.7 mph. Compared with an old Clio the land speed may seem sluggish but don’t expect any sort of performance from the Renault in a lake or your local forest. There are currently two Sherp options available to buy, so choose wisely if you’re only going to pick one. Option 1 – The soft top Sherp ATV is perfect for summer. It’s cheaper, lighter and who never wanted a convertible? Option 2 – The hard-top is ideal if you’re planning a road-trip to Serbia. It’s a little warmer and waterproof; which is always nice! The Sherp ATV soft-top weighs over a tonne. At 1300 Kg it’s surprisingly lightweight and can pretty much turn on a penny with its skid-steering ability! The hard-top option is slightly heavier but designed for harsher weather conditions. Finally, you may have noticed the ‘slightly’ over-sized tyres at each corner. In fact, this thing looks like a matchbox on wheels and those tubeless, ultralow pressure tyres stand at 160 cm. 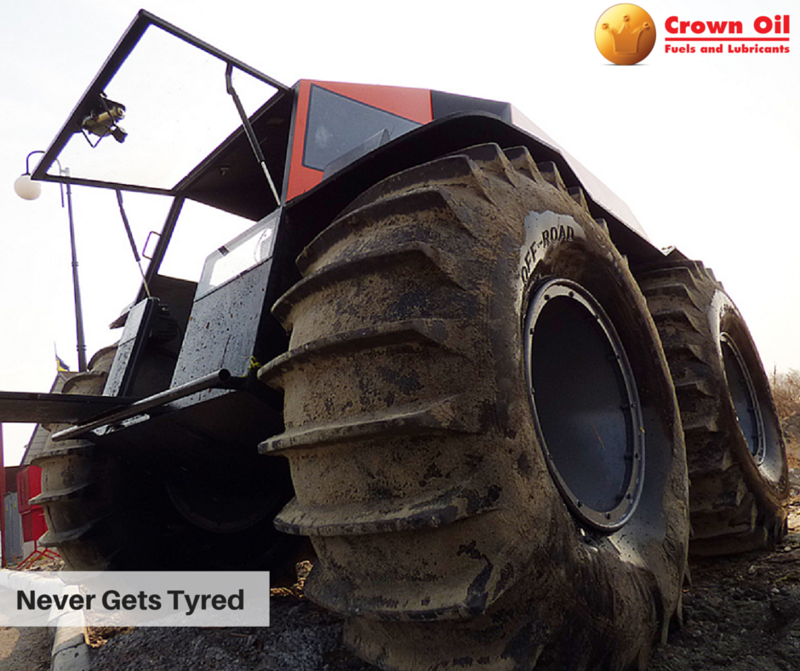 These huge tyres create a clearance underneath the Sherp ATV of 60 cm which means that it can literally get over anything, even a bad break-up with its girlfriend! Diode Headlights – For approximately £140 you can brighten up your Sharp’s visibility with these cool headlights. You’ll need an onboard generator for additional power though! Onboard Generator 60 A/h – At just $900 (or £620) you can add some on-board power to your ATV and enhance things like the headlights and power an Independent heat warmer system. Independent Heat Warmer System – Parting with just over £800 will create that cosy feel in your ATV which will certainly come in handy for those winter months! In-wheels 50-litre Fuel Tank Upgrade – Get a bargain with the additional fuel tank option. A snip at just £130! A maximum of 4 can be purchased increasing total fuel capacity to 258 litres! Original Sherp ATV Transporter Trailer – For just over £2000 you can transport your Sherp ATV anywhere you like with the official trailer complete with its own braking system. This article was written as part of our Only Fuels and Horses feature on our Pinterest page! Why not take a look at it for more diesel-powered machines and vehicles?